Today we had a stiff 15 knot breeze out of the SE all day. The past few days the fishing has been hot from 9-10 am, but today we had a slow start. We got into a few dolphin and then that action stayed consistent throughout the day. Our biggest today was a 44.6 pound bull, awesome fish. Ben got on his first white marlin in the morning, but the billfish bite was slow for us today. Mid afternoon we had a blue marlin all over our dredge and it ended up eating the long rigger that nobody was able to get to quick enough so that turned into a miss. Great day with lots of action though. We had a new group startup today and the day started off right with 5 dolphin and 2/2 on white marlin. 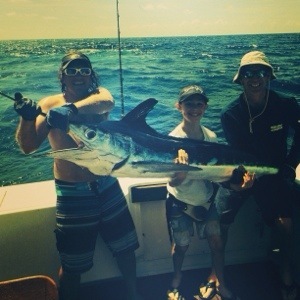 Congratulations to Bob and Todd on their first white marlins! The rest of the day was slow. 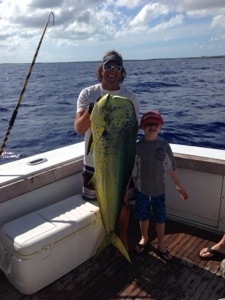 We jumped off a sailfish mid day then missed a small sail later in the day and picked up one more dolphin. I don’t know what’s going on with the jump offs the past few days, but it needs to stop. Hopefully the fishing will continue to improve. Honestly, we really can’t complain, we are just so spoiled here with rediculously good fishing! We have been really lucky the past week with perfect weather. Unfortunately the fishing has not been up to par. The barracudas have been extremely annoying eating 2 dozen of my dink baits a day, and the billfish bite has not been where it normally is. Luckily we have been getting the bites we need and today we caught 3 dolphin, 5 small tunas, jumped off a white, and released a white an a sailfish. It’s been a fun liveaboard trip with Sid, Rob, and Mike from Winsconsin. There certainly was no shortage in laughs, and we all had an awesome time! Thanks for the memories fellas! Well we have been busy the past week island hopping. We spent a few nights in Nassau then picked up our next group of guys (Sid, Rob, and Mike) and headed to Highborne Cay for the night. Then we fished the bridge and picked up a few dolphin, one at 46 pounds, but overall the fishing was slowwww. We decided to end the day early and do some diving around Little San Sal, then anchored out on the NW corner there for the night and bottoms fished. We caught a few grouper, Yellowtails and muttons so overall the fishing wasn’t bad. Yesterday we started at the bridge early and got Sharked on every tuna we caught. We left there and ran to Alligator Point on the west side of Cat Island, but it was completely void of life. We decided to salvage the day and bottom fish for a whole and caught plenty of Rock Hinds for dinner. Amazing weather this whole trip but poor fishing. Today we fished out of Cat Island and lost a sail and a white marlin just before we got the release – major bummer, then picked up a dolphin and a nice white marlin. After that it was dead for the entire day. Not at all what we expected but the fishing was really bad for the rest of the fleet here. Hopefully tomorrow we can get a slam with this group since it is their last day. 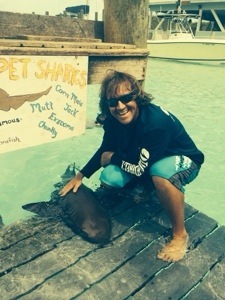 Yesterday we checked out Compass Cay and it’s ‘pet’ nurse sharks. It was pretty wild since they would all come right up on the dock and let you let them. We did some snorkeling here and there but the clouds and strong W wind kind of made for a difficult day. We stopped by and checked out the pigs again then called it a day. Two really bad squalls blew through which made for an uncomfortable night docked in Staniel Cay Yacht Club. Today we made the run up to Highborne and did some yellowtail fishing for a little while then snorkeled there all afternoon. We are due in at Atlantis tomorrow. This morning we made our way to Staniel Cay. I was pretty excited to see somewhere new in the Bahamas, especially Staniel since I have heard so much about it. 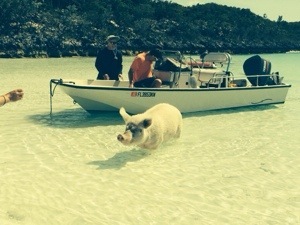 We arrived safely and rented a skiff to run around to do some snorkeling, feed the pigs on pig island, and check out the infamous Thunderball Cave. Pretty amazing and a great change of pace. Today we had the owner of the OverUnder (Trey) and his family on the boat, and will over the next week doing some island hopping. Today we fished for a few hours here in Cat Island. We had a beautiful sunny day with winds out of the ESE around 12 knots. 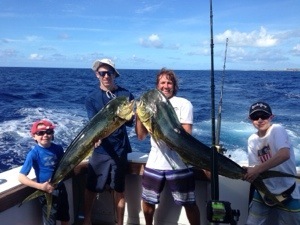 Hutch and Justin both got hooked into a lot of nice Mahi throughout the day. Justin had a nice bull that went 35 pounds. Shortly after we got into a nice white marlin that Justin got to the boat after a good 20 minute fight. It was his first white ever, and we were able to safely bring it up for a quick photo. We spent the middle of the day anchored in Winding Bay for lunch. Winding bay is a pretty amazing place, and the backdrop is so beautiful. Hopefully the internet will work well enough for me to post the panoramic. 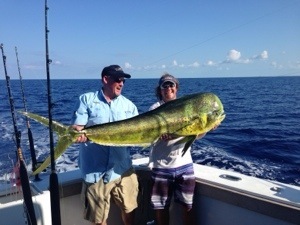 We trolled our way back to Hawks Nest and got into some more dolphin, and Hutch caught a big bull that was way taller then him! That fish weighed in at 40 pounds. Fun day all around. 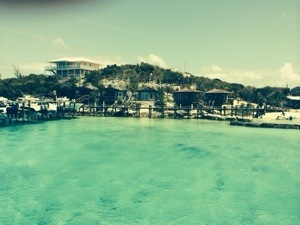 Tomorrow we are making our way to Staniel Cay. Can’t wait to check out a new place and do a little exploring.